Still life of vase, bowl, fruits and vegetables with landscape background. 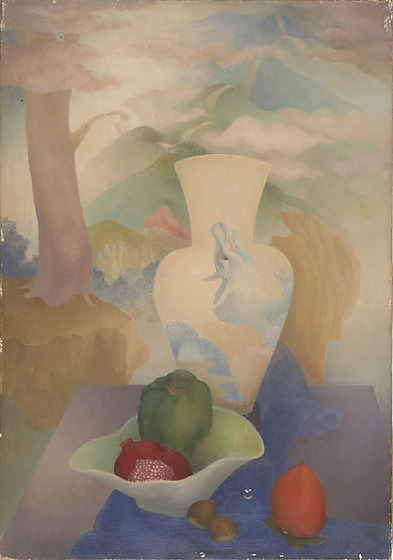 Tan hued vase with blue hued dragon design appears behind an irregularly shaped green and gray hued bowl holding a bell pepper and an open red pomegrante sitting on a blue cloth lying on a purple hued rectangular form; two brown chestnuts appear at base of bowl, center foreground, next to an orange persimmon, lower right corner. In background, a tree rises from brown earth in front of blue bushes along upper left; mountains in hues of green, blue, red and brown recede into the distance, shrouded in white and pink clouds; a path appears over mountaintops.